This is my favorite slicing tomato! Big heirloom beefsteak type tomatoes that can be up to 1-2 lbs each. 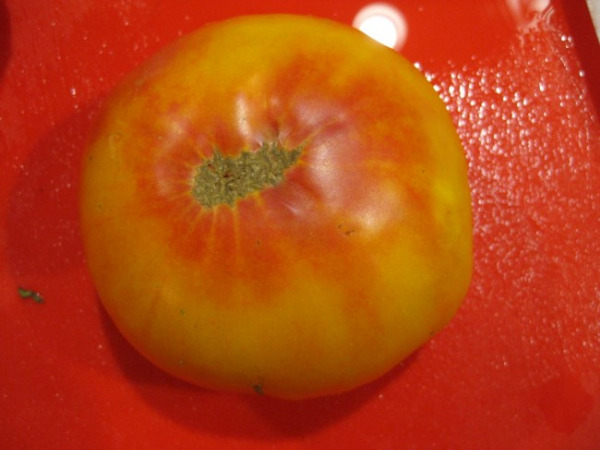 This tomato is a brilliant yellow orange with red marbling. It has a mild sweet flavor that is just perfect for that BLT sandwich. All of our plants are grown right here on our farm in Hendricks county without any chemical intervention. Seeds saved from plants grown locally will grow and produce better then plants grown in foreign environments with different soil, weather and moisture then what we have here. All of the seed that we grow and sell are from non-hybrid heirloom varieties that are all non gmo and open pollinated. All of our seed saving work is done by hand without machines so you will get some plant material and chaff in with the seed. All seed packets have been made from recycled magazines. Approximately 20 seeds per packet.